Unfortunately, I was unable to make a screenshot of this game. 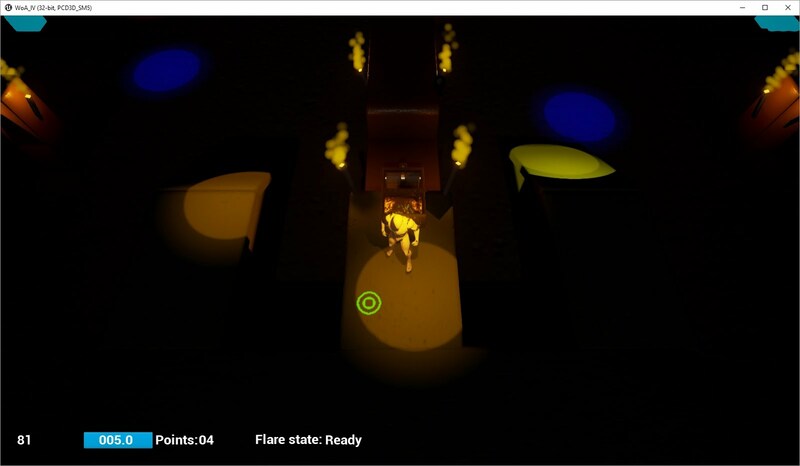 The game starts with a cool fire shader and an intro story explaining the plot. It was impossible to skip the intro which was somewhat annoying. However on the next run of the game the intro is skipped entirely. You move a couple of skulls around and try to collect more skulls. As you collect skulls by moving onto graves your line of skulls get longer. There is a minimap over where stuff can be found, and there you can also see some dark shadows that hover around and collect skulls as well. Sometimes a figure looking like a fool appears, I was uncertain if I was supposed to collect him or not. As you move around your skulls shrink starting from the back of your line of skulls - when the last skull has shrunk you die. The minimap is a little confusing as it is not aligned with the direction you are moving. Sometimes I died without knowing what happened. The music sounds like something from a spaghetti western movie, and the sound of collecting skulls sounds like a cartoon voice? I don't think either of those things fit the game. The frame rate is very good and the graphics are very glass and crystal like with lots of stars and reflections - that was what I liked best about the game. The text showing your score and the icons could also use some work. I got a little dizzy playing the game after a while. The game was not very original or entertaining for long, it needs more variety and better feedback to the player about what the goals are. I had to do a search to find out what this game was called. Maybe put it in the start menu? The game has a nice tutorial. I also like the level select very much where you move your character into the level you want to play. You guide your character around in an urban-like 3d environment to find treasure chests. You have to avoid the spotlights or you die. The lights move around randomly but if they get close they start to chase you. You can go invisible for limited amounts of time to avoid the lights. The graphics are simple but clear. The special effects look good. Part of the challenge is to find out how to get to the chests in the dark environment. I don't think the treasure chests fit with the rest of the graphics however, maybe something more modern would be in order, like a safe? The sound and music is OK, but the gameplay was more fun than I'd like to admit, as it is a quite simple idea. The game had a very good.... feel, mood... whatever you want to call it - that made me want to explore more and continue playing. I can really see this as a successful mobile game. 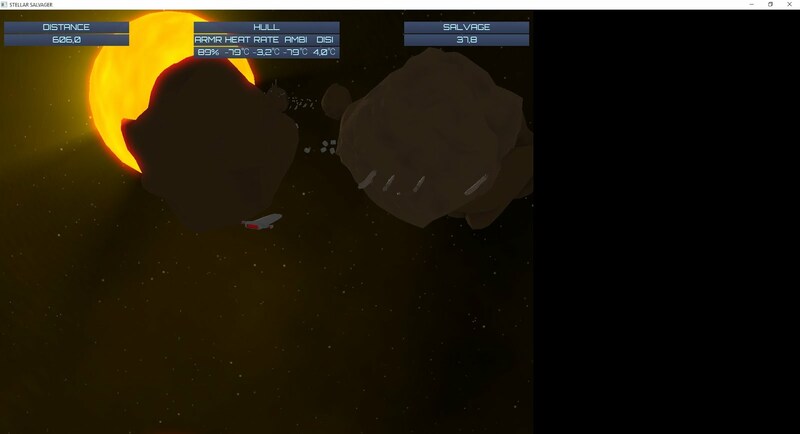 You navigate a starship towards the sun collecting salvage in the form of small barrels, but you have to keep in the shadows of asteroids to avoid overheating. Don't get too close to asteroid or other space junk though, as you will crash! At first I had a really hard time controlling the ship, and the camera flew all over the place, but after a while I got the hang of it and it got a lot more entertaining. The graphics are good, I especially like the sun ray effect. It was a little hard to know if I was in the shadows of asteroids or not, that should have been more clear - maybe light up the ship in red when hit by the suns rays, or darken the ship a bit while in the shadows? Sometimes I overheated very quickly and died at times I was certain I was in safety. The sounds are good and space-y and creates the right mood. There is no music but I think that fits the game well. Also the menu screen font is good and fits well with the rest. A can easily see this game evolving into something more with a bit of a story and different types of quests. It is a first person slasher where you walk around in something looking like a collection of bones killing shadows with a knife. You can also block attacks with a shield. You can also turn the light up and down - when the light is down you heal, but then the enemies are stronger - as if they were not strong enough in the light! You walk around in something looking like a skeleton world. There you meet some dark apparitions, different shadows, some attack you close up, others shoot balls at you. You can locate shadows by listening to where they are as they moan a lot, which is helpful. 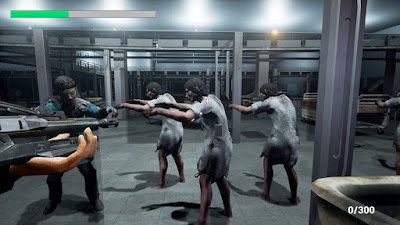 The game is quite hard, I usually died within seconds - the shadows were just so much better at hitting me than I was at hitting them, and if I tried to run I was quickly overwhelmed by the sheer amount of shadows that appeared. I could block but then I could not move, and when I attacked after blocking the shadows had lined up to kill me. I played several times but did not seem to get better at it. There is no music, but an eerie background sound with some moaning and something that sounds like wind. The graphics are simple polygonal but works well. The game was mildly entertaining for a while, and had little variety and depth. Maybe a ranged weapon in addition would help, or different types of attack? You are Prometheus, a titan, and the Vrykolakas are coming! You move around and rearrange and rebuild a temple to keep the baddies out. You move blocks around, and you can also 'evolve' blocks to better versions. This is all explained in the intro but it is impossible to remember. Luckily there is a supplied 'cheat sheet' .png image that explains the evolutions. Good thing I have multiple screens so I can keep it up at all times. 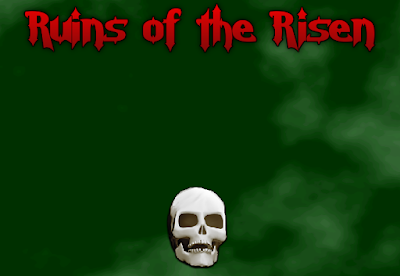 But first you have to kill some skeletons and collect their bones, as this is the currency in the game. The evolved ruins have different properties, like it can generate more bones or shoot missiles at enemies. I like the combination of moving a character around and the city building. However, the character moves too slowly, and the skeletons become too numerous too quickly, so I quickly died time after time before I managed to evolve much. If anyone can offer a strategy I am all ears... I would love to see the evolved ruins in action. The sound of the game seemed very loud! I had to turn my speakers down for this game. The music sounds like a mixture of greek music and country and western? The sounds were very simple, 8-bit like. There was no movement animation, and the different tiles looked very simple, and it was hard to remember which were which and what they did in the thick of it all. It was a nice touch with the death screen (that I saw all too often...) It was a little annoying that the intro showed each time I started a new game. REVIEW TIME - PART 2! It is a kind of city builder game. You have to protect your citizens. You build buildings with different properties during the day, and watch zombies come for your citizens at night. You can build houses, clinics, spike traps and a genome lab. You can also upgrade each building. Citizens can evolve using the genome labs. You can also move the citizens around to avoid the zombies. The citizens have different properties. The controls are a little confusing. To cancel city building it is the right mouse button. To cancel citizen select it is the left as you move citizens with the left. I liked the day night cycle, and there is something there, but I just could not get the hang of it - maybe some more instructions would be in order - or at least some more mouseover help text for the different choices? The music is sufficiently eerie and sets the mood. The graphics are simple, especially the UI, but I like those little guys! I died taking this screenshot. You search for artifacts in 5 different ruins. Sometimes you have to find different colored keys to get through the doors to the artifact. When you find the artifact, you have to escape the ruins. Sounds simple? One problem - in the ruins there is a monster that eats adventurers for breakfast and you have no weapon. If you hear steps you quickly have to turn off your light and hide or suffer the deadly consequences. The light effects are very good, so is the music, and so are the graphics (although there is no animation) and sounds. The levels are timed so you can play each level several times to beat your own high score. The artifact is placed at a different place every time so you can get lucky and get a very good time. I had fun playing this game. The menu screen looks very good. You walk around in a dark maze - not a city as the title would suggest. Your oil is running out, and if you are too long in the darkness you die. The goal is to escape. You can refill your oil by touching lamps. You can also light new lamps that you find in the darkness, improving your reach. Find a key, and find the door. I had a hard time finding the door at first, it looks too much like the regular walls. The instructions also come after level 1, when you have already learnt what is said, maybe they should have come earlier? Later in the level you have to avoid spikes, and you pick up some purple things I assume is coins? It seems I can pick up coins at several meters distance. If you die you respawn at the latest checkpoint. I like the level design and the light effect. The animation is simple but sufficient, so are the rest of the graphics. After initially having some problem playing sound that problem resolved itself after a computer restart - the music is very good and sets the mood, the sound effects are so-so, especially the footsteps could need some work. I think it is maybe a little too easy to die on spikes considering the small light radius and the slow movement - If I have to move even slower to watch for spikes it will take a very long time to clear levels... Also, I would prefer to move with WASD instead of the arrow keys... Old habits die hard. I was impressed that I got keyboard shortcuts in my native language! A good game with potential - I hope the author continues work on it! REVIEW TIME - PART 1! Half the fun of Week of Awesome is playing the other participants games. I know how much I enjoy reading about others experiences playing my games, so that's what I will be doing now for YOU, offering my opinions on graphics, sound and gameplay. I will try to be as honest as I can - I hope I don't offend anyone! I try to be constructive in my criticism. Also remember, all praise also comes straight from the heart! I am not an official judge in the competition, so I will not hand out scores. I will try to include screenshots of every entry if that is doable without too much hassle. (I.e. 'Print Screen' works). So - on with the reviews! After a rather huge download of 800MB, I'm finally ready to review this game. At first, I'm going 'WOW' - the graphics look great! It is a first person shooter. The main character and animations look very good. I start playing, and it is kind of hard to navigate as it is difficult to tell the difference between a glass wall and a walkway. The zombies seem invulnerable, I did not manage to kill a single zombie even if I emptied my magazine in the zombies heads and several restarts. The zombies killed me easy peasy however - but there is no feedback when the zombie hits, except the health bar decreases. The zombies seek you out, but the motion is very jerky. There is two kinds of zombies - patients and doctors? No discernable difference between them except different graphics. The area you play in may be a prison or a hospital. When I died I found no way to restart the level short of exiting the game using ALT-F4. The menu screen is cool. The sounds are also good, however after a while you get tired of the zombies repeating the same sound over and over. A game with good potential, but it seems kind of buggy at the moment. The game starts with a good looking 16-bit retro intro telling the back story of a magic super-t-rex that has to eat flesh to survive and to regenerate its flesh. Click zombies to approach and eat them, to regenerate some of your flesh. You go from room to room and eat zombies. You can kick doors and headbutt boulders that are in your way. Sometimes there appears a policeman that will shoot at you so some of your flesh will disappear. You seem kind of invulnerable to the zombies, they only play the role as food. It is a nice effect that you can see the dinosaurs skeleton if it is in the dark. It is also nice that you can see the flesh progressively cover the dinosaurs skeleton. However if you stand around doing nothing, nothing happens. Also there is no real challenge - zombies are completely harmless and the policeman is weak and quite easy to neutralize. I ate over 70 zombies and were never close to dying. When you get shot by the policemen it takes a while before this is reflected on your pawn so it's hard to know the amount of life you have at some points. I got stuck in walls and other objects and the graphics were a bit jerky at times. The music was all right, nothing special, but not bad. The sounds were a little crude. Graphics were okay, especially the dino and the wall decorations looked good, the rest was so-so. I had some problems starting the game at first as there were no instructions, but after a 'java -jar runic.jar' I was good to go! 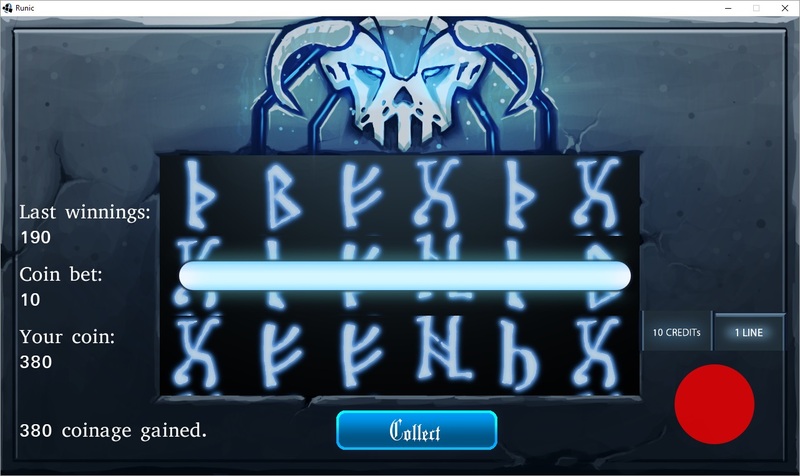 The game is essentially a slot machine with runes and cool music. Choose how much money you want to bet, choose number of lines and push the big red button. Repeat. The background graphics looks great, the collect button and the big red 'start' button looks kind of out of place. I think there are 3 different fonts in the menu screen - maybe a bit much. 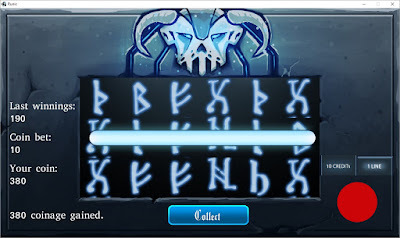 I think the runes don't look distinct enough, maybe there should have been different colors to easier see the difference between them. Also, the gameplay is a little lacking - depending on if you like slot machines or not. The game screen looks very cool, as you can see from the screenshot. The game graphics are quite simple as is the music. The concept is that you have a limited set of lights, and each light lasts for 5 seconds only, so you have to light up the maze - memorize it - then move around by radar to pick up more lights and ultimately find the exit. Not a bad concept, I just wish I could play it... I must admit I think this game has kind of a bug on my computer as the character moves around slowly as molasses - it takes 6 seconds to move from one square to the next which makes the game unplayable for me. The menu screen looks great. 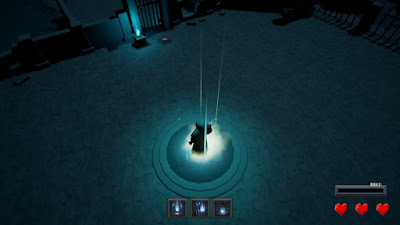 The game is a kind of turn based tactical combat single character rpg where you are a necromancer that can summon two of three pets (with names like Undead Kitty Tiger) to help you during combat. You follow the quite well written story of a girl who comes home to a mansion trashed by intruders. Quickly you are thrown intol combat with some knights that claims your face is on wanted posters. Your summon minions that can attack, swap summon and defend. You can also throw some spells: heal, revive and buff. 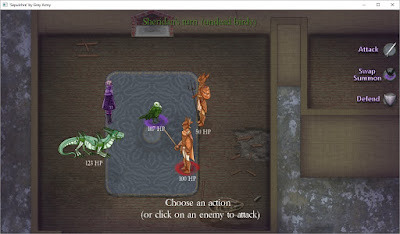 The first enemies die quickly..After the combat ends, you go to another room and another combat and so the game continues. I'm uncertain if there is a big difference between the different minions apart from different amount of health, making switching between them kind of pointless. The graphics look very good, maybe hand drawn, however there is some problems with z ordering a places (the bottles). The animations consists of the minimum amount of (good looking) frames. The combat music is cool but tends to end before the battle is over, maybe it should loop. The sound is good, but has some background noise at places, especially noticable when there is no music. I'm quite happy when the results. When I'm just starting the game up to test something I often ended up playing it for 10 minutes or more, that is usually a good sign. Today I added some quests (well, more like narration), 10 levels, a final boss fight, a simple and cheesy extro, and did some more tweaking of weapons, enemies, graphics etc. I did not have as much time as I'd like to work on the game during the weekend so I brought out my big feature-cutting axe and cut down to the bare essentials. Now I'm going to spend the rest of the evening (it's 23pm here now) to catch up on the other contestants developer journals, that is always interresting. I'm also looking forward to play all the other games - and will do a review of each and every game this year as well. Feels good to have delivered something! Good luck to all. 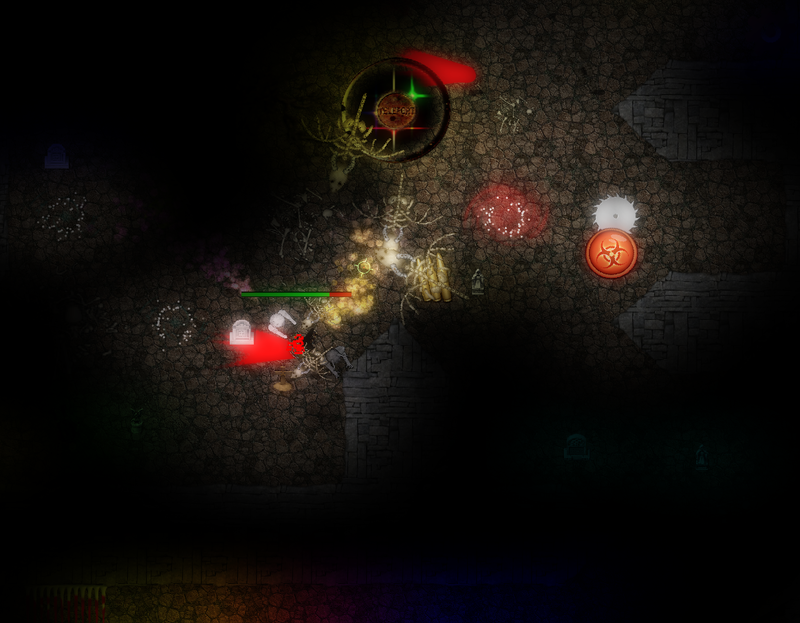 The day was spent mostly with adding more enemies, graphical tweaks, new sounds, and postprocessing. I also added a intro story, added some new textures etc. Also I changed the weighting of how often different enemy types appear so that tougher enemies appear more rarely. I also gave the different enemies different sizes and colors and weapons to make them more easier to spot and discern between. I repeat the same mistake as I always do, spend lots of time on sound, music and graphics, and too little time on the actual gameplay. Luckily my game engine makes it quite easy to cook something like a twin stick shooter quickly together - but games should be fun, and even if shooting stuff is fun in itself I feel I have to add more stuff for the player to do... Preferrably an interresting story of sorts - one which is hinted at already in the intro. Let's see what the weekend brings! Even if I can't work anymore on this game I'll still be happy that I managed to deliver something that is quite enjoyable to play - if the response is good I may continue working on it and maybe try to Greenlight it? Who knows? There is not a finite goal for the game yet, only the goal of going to the next level. 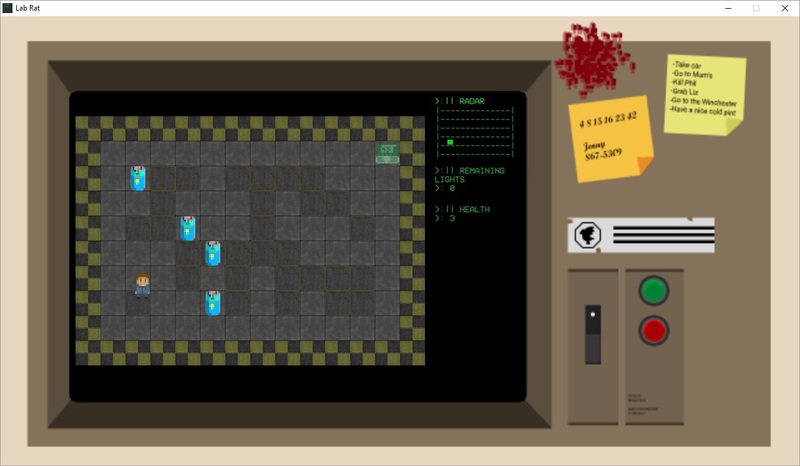 It is now a quite basic twin stick shooter (actually, right now it's move with the keyboard and aim with the mouse) - but I intend to add some interresting strategic choices for the player. * You can shoot spikes and rotating saws to make the environment safer for yourself - but that also makes the environment safer for enemies. We'll see how this turns out! The somewhat simple menu screen is finished. Is it obvious that you have to click the skull to start the game? 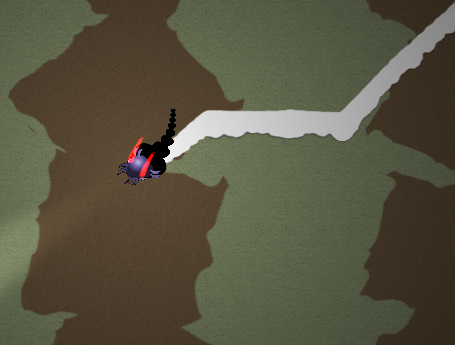 Also, I have implemented different types of enemies, some large slow ones, small fast ones, and some flying skeletal dragons that breathes fireballs. 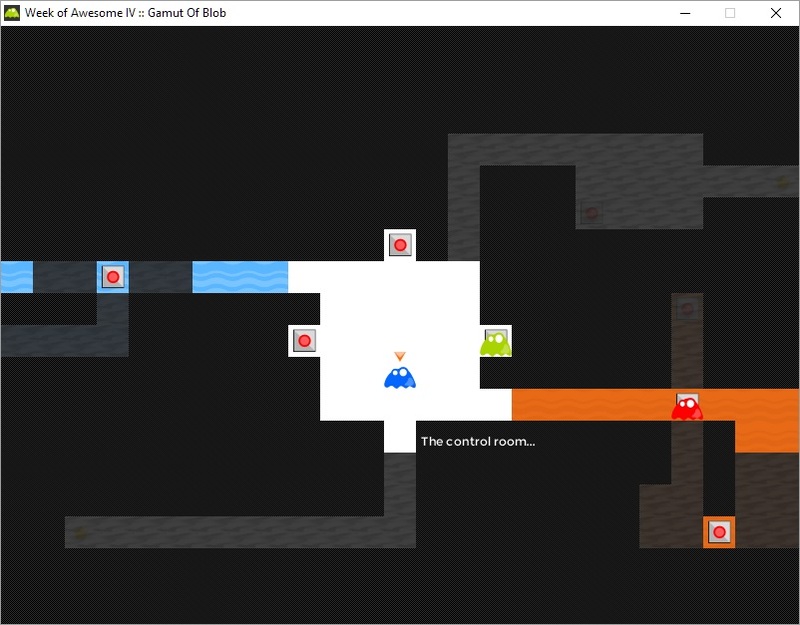 Also health and ammo pickups are implemented, and a goal of each level - the somewhat simplistic 'find the key and go to the exit' to enter the next level. The mood for the game should be dark, eerie, and somewhat panicky when the enemies storm you. I'm quite happy with the results so far today, tomorrow I will start on sound and music to create the right atmosphere... Also I will have to add a final goal (maybe an end boss?) and some kind of story. Here's a few seconds of (really low quality) video. 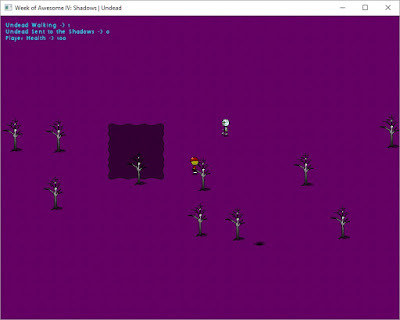 Animations for the protagonist and some zombies are done. Now I need to work on pickups, keys and exit logic. Last year's Week of Awesome was -- well, awesome! -- so even if I have very limited time I'll be participating again this year. 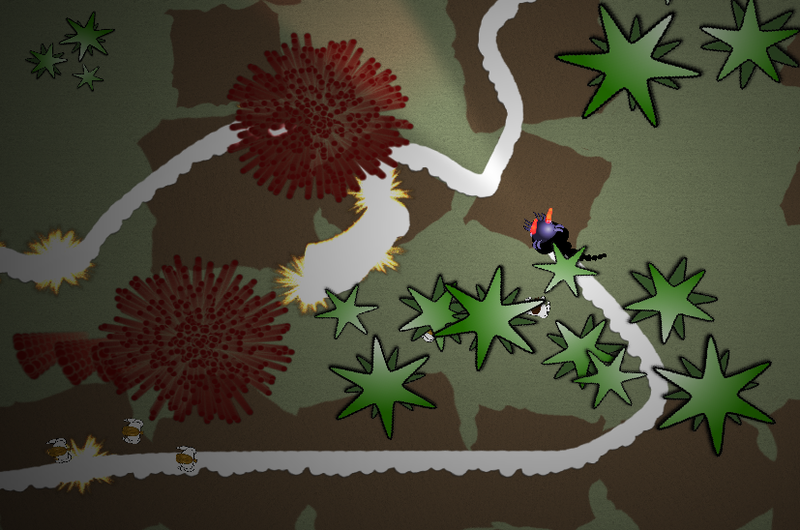 The ambition level has to be lowered a bit, and I will go for a twin stick shooter kind of thing with limited graphics assets, and rather try to work with sound, lighting, particle effects etc. to make something interresting. The themes for the competition are: Ruins, Shadows, Undead and Evolution. I don't know about the evolution bit, but I'll make a game incorporating the other 3 elements. 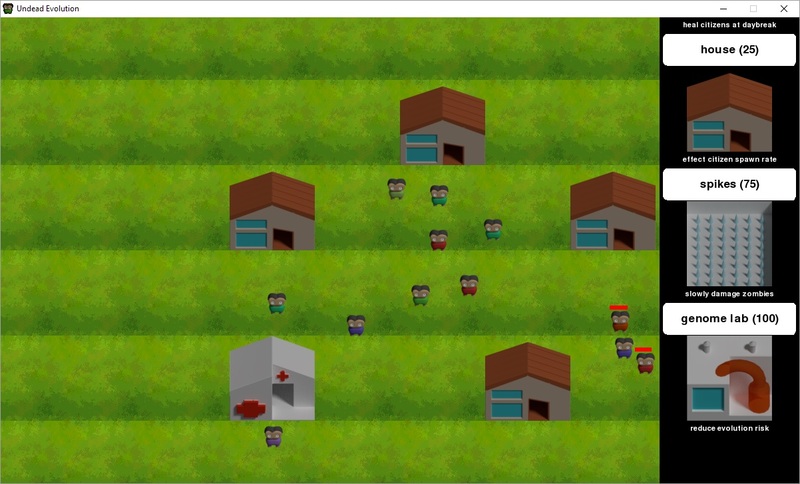 So the basic idea: Twin stick shooter where you are a marine, shooting varying types of zombies. Some health and ammo pickups, find some keys and unlock the door? We'll start out there, and build on the idea if time permits. Not my all-time favorite, but I'm IN! My idea is to have the player shift shape/color and then enter portals with the same shape/color. The theme this time was 'You are the monster' - so the first thing I did was to draw some sketches of monsters. After some discarded attempts I came up with a monster that looked like if Cthulhu and a frog had a child together - a Cthoad? Anyway, I was quite happy with it - I figured it should have fiery eyes, a slithering body, ooze slime when moving around, and have horns, tentacles and long pointy teeth. I went for a simple art style this time and rather few screen elements. The progress today has been good, tomorrow I have to create some actual gameplay! It has been a few days since I submitted my game 'Death is Awesome' to the GameDev.net's third annual game jam 'Week of Awesome III'. This post will chronicle some of the thoughts, processes, problems etc. encountered during the one week spent creating the game. At first I thought that the theme, 'Death is useful' was really cool, and then I sat down to try to create a game incorporating this theme. The first thing that popped into mind was that you had to sacrifice the player character to set off traps so that the next player character could bypass it, or that the corpse of the previous player character would benefit the next one in other ways. Then I figured that since it was such an obvious interpretation of the theme it would probably be done to death (sic) so I should probably try to go down another road. Then I thought about an olg german board game called 'Ursuppe' in which you play as amoebas in the primordial soup, that when an amoeba dies it serves as food to other amoebas of different colors. So I thought that would be quite cool, retrieved the board game from my closet and played with it a little to see if that mechanic could be converted to an enjoyable computer game. After a while tinkering with that idea I eventually discarded it, and went back to the drawing board. I started googling 'death', 'death is useful' etc. to get some inspiration, and came over a youtube video about the black plague in the 1300's. The video itself was very interresting and what struck me the most was the incredibly interresting setting - Europe in the 1300's, full of pestilence and death. But how was death useful? It was certainly useful for the people that survived, that now had access to a lot more resources than before. It shifted the balance of power from the lord to the farmer in a way that forever would change Europe. But making a game about that would be too time consuming. A little frustrated by now, I then remembered a very interesting article I had read some time ago by one of the game designers behind 'Magic: The Gathering'. (http://archive.wizards.com/Magic/magazine/article.aspx?x=mtg/daily/mm/174) - I thought I revisit the article and maybe get some ideas. A game needs a goal, a set of consistent rules, inertia that drives the game forward, an element of surprise, room for strategy, fun (that can be achieved in a variety of ways), and flavor. The game also needs an element of conflict: What does the player want, why can't he have it and why should we care? I thought the flavor was already in place, Europe in the 1300's, black death, farmers. So what about the rest? My inertia element was going to be plague and hunger. The cause of the spreading of plague was the rats, so that fell into place as a natural adversary in the game. Rats spread the plague, that kills farmers, and no farmers lead to no harvest which leads to starvation. I thought it would be fun if the rats also ate the harvest, evil rats that they were, and so it was. So, farmers - good guys, rats - bad guys. Kill rats, help farmers. Now I had a basic idea for the game but as it was now death was not useful at all. Quite the opposite. I thought, who would benefit from death in this scenario? I thought about an undertaker. A priest. But then it struck me: Death himself! He must have had a field day at the time with so much Death going on. But why would he want to help the farmers? What does Death want? Souls. How does he get it? Deaths. Why doesn't he get it anymore? Too many people died so population has shrunk so much that not enough people are born to die. Crisis in the underworld! I then imagined a little family in the netherworld with loving and overprotective Mom Death, strict and stern Dad Death, and little spoiled Death Jr. Dad Death is worried about the decline in deaths and wants Death Jr to go out and be useful for a change. Help the farmers in Europe get back on their feet so humanity can survive! The idea made me smile so I thought that it was something I should try to make. First I thought Death should only kill the rats. Then I thought hey, he has a scythe after all, why not cut some hay with it? The idea started to form. Kill rats and harvest hay. Bring the wheat back to the barn. I started designing the main character. I wanted a flowing cape, a flaming aura, a skull and a scythe. As the basis for the game I used my own game engine. The engine uses Box2D for collission detection and physic, so I figured I could create a chain of bodies connected with revolute joints to make up the body. Fired it up, and it looked really good. I created a particle effect to place on the character's head to create the aura. I fiddled a lot until I got something that looked half acceptable. It was fun just to fly around. I figured Death needed a scythe so I made that. 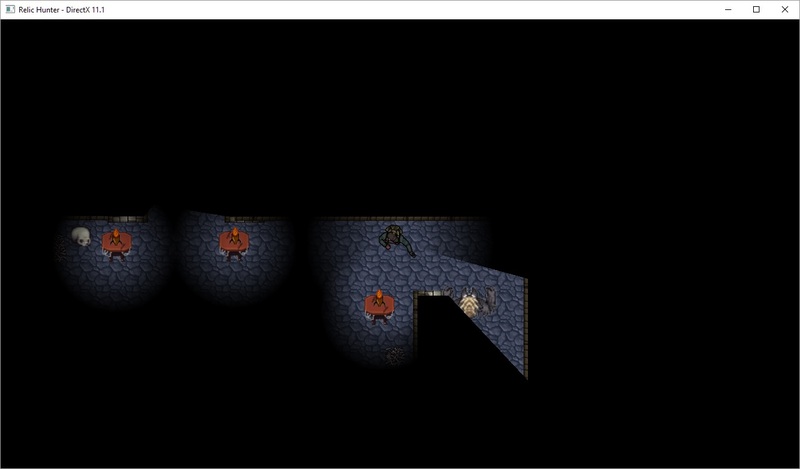 Then I thought he should probably be able to shoot some fireballs to kill the rats, so I added that. I also added controller support, and it was very fun just to fly around and shoot fireballs and chop with the scythe using the controller even without any enemies so I was happy! 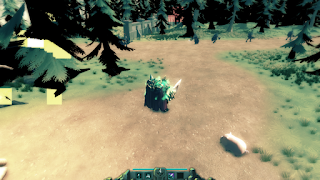 I began creating the harvesting mechanic. I figured the player should be able to harvest each field 3 times and wheat should appear each time you swing the scythe that you then had to collect. The player should have a bag that you filled with wheat that would get full after a while, so you had to empty it. Then I had to create somewhere to place the harvest, so I started with crates. It did not seem to fit with the time period or even how things worked back then (or even now) so I tried to create a horse cart. My drawing skills were not good enoug to pull that off, so I opted for a large basket instead, modified from some free graphics from Wikipedia. Added some tween animations to the wheat when you harvest it so it bounces around a little, then figured I could use the same animation for rats when you slash them. I then added images of wheat in the basket to show how it filled up when you added wheat to it. I also created a particle animation with flying wheat for each time you do a harvest or placement of harvest in the basket. It started to look good! I fired up Spine and created the farmer animations. One farmer boy and a farmer girl. I figured I could programmatically change the colors of clothes and hair to make a varied set of farmers - a cheap option but I was short on time. I also created a rat animation based on an animation I found online. Time to put them into the game! In the game the farmers and rats didn't do much until I added some behaviors. I thought each creature should have 3 states: Neutral, Defensive and Aggressive. When neutral they should just walk around. When they spot the player they should change to defensive. While defensive they should flee trying to escape the player. When the player is no longer near, they change back to neutral. While in neutral sometime rats change to aggressive. When aggressive they seek out appropriate targets, that is wheat laying on the field or wheat in baskets. They then 'seek' those targets to eat the wheat or steal wheat from baskets. 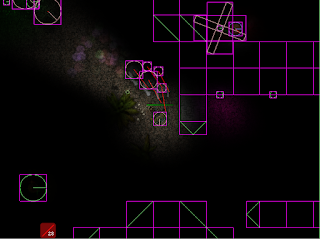 At all times I also needed to keep the enemies within the boundaries for the game so I added a 'Keep within Box' behavior as well to all creatures. I also added a tween animation for the farmers when they died, so the fall on their face or on their back and bounce a little when they die. Looked funny. It was very satisfying to see the mobs react to how the player moved around and to the players attacks. But I thought the neutral behavior was a little boring, so I decided to change it to a flocking behavior instead. Adding a flocking behavior to a single rat does not do much so I had to create behavior groups. This is something I spent a long time on, getting the behaviors right. 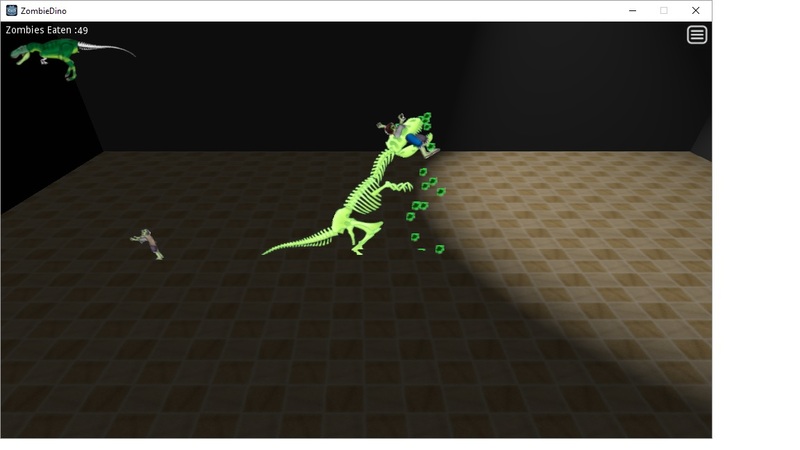 But after the change rats move in coordinated groups that spread out when the player approaches, then go back together again when he no longer is near. Looks very good so I think the effort was worth it. Time to add some sounds, so I created a scythe sound, and recorded a lot of different sounds with my voice using a voice distorter app on my Android phone. This turned out surprisingly well. I also found some sounds on Freesound.org that i imported into Audacity and remixed to more fit my needs. I then fired up jcgMusic to create music. I thougt I should at least have menu music, in-game music and a piece for the story to set the mood. I clicked and clicked until something I liked turned out. Converted the midi to a chiptune using specialiced software. Imported the resulting sound file into Audacity and added some reverb and chorus and cleaned it up a little. Sounded OK so I added it to the game. I thought about placement of baskets and fields. To add a strategic element I decided to have the fields and baskets spread out so the player had to choose where he wanted to deposit wheat. Different baskets were near different fields, so the player has to choose between depositing all wheat in one single basket that is easier to defend from rats but that which distance from the field increases as closer fields are emptied, or deposit wheat in the nearest basket at all times and risk that rats eat from the baskets further away while you do so. If rats eat too much of the harvest it is game over. The idea was good on paper but did not turn out as well as I had hoped in the final game. I think it would have been better if I had more indication at all times about where the baskets and rats were on the map. It was a little too hard to see when and where rats ate your wheat, leading to 'game over' without even knowing why a lot of times. I figured I should implement the plague in the game. A plague that spreads. So I started creating the mechanics for that - a rat could spread the plague to other rats, and to farmers. If all farmers die it is game over. I figured that should be a loose condition - all farmers dead. I also made it so the player could kill the farmer if he was not careful, that way the player could shoot powerful fireballs to kill rats but due to the wide arch of the fireball it was a rather high risk of killing farmers at the same time. So kind of a risk/reward mechanic: Kill rats with the unsafe but very effective fireballs at the risk of killing farmers, or use the more safe but not as effective scythe. I also wanted the fireballs to set baskets on fire but that never made it into the game because of time restrictions. After some thinking about the problem of rats eating your crops too quickly I came up with a couple of solutions. 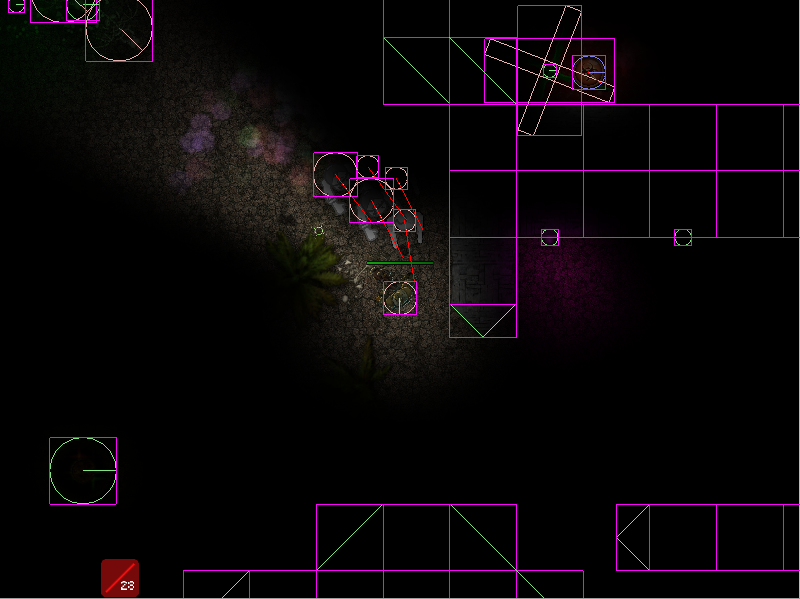 I added two elements to the game that would distract rats from eating crops: Lamps and corpses. The lamps could be turned on by fireballs and added to the strategic options for the player - depending on which lamps the player turned on he could control the playing fields - distracting the rats over to an area that was already harvested or where there are no fields or baskets to mitigate the risk of rats eating his crops. The same with corpses. Killing a farmer in a certain spot would distract rats to that spot. So now you could also herd humans to where you want them before you kill them. I though killing farmers was kind of counter productive, you were there to save humanity after all, so I made it so you could only kill plague infested humans without getting a score penalty. But be quick, because when the human contracts the plague it keels over quite quickly (The real black death killed a human in 4-5 days so I felt that was within the flavor of the game). Now death was also useful in a new way. Now there were starting to become quite a lot of mechanics and rules in the game, and I got feedback that said it was too hard to understand what to do so I could not avoid creating a tutorial. I did not want to simply put all instructions in a readme file because people seldom read those anyway. Also the game might be placed embedded on a website somewhere and then the player won't have access to the readme file anyway. 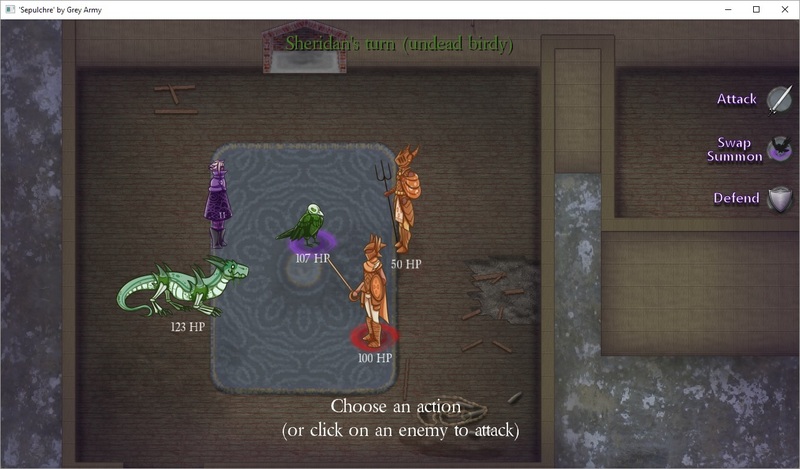 I spend a whole day on creating a quest system to be able to give the player tasks to perform, and another day to create the dialog system that would progress the tutorial quest. I created the dialogue system so that I could also use it for the intro to explain the background for the game. I downloaded skull images for my person gallery and found some free clipart to try to give each of them a personality: Eyelashes for mom, a monocle and moustache for dad. And I figured I also needed a narrator, so I downloaded a rat skull and gave it some glasses to look smart. Presto! Wrote an intro story and the tutorials. Tried out the tutorial on the girlfriend and it seemed to do its job. Now I needed some levels. The game engine can create a lot of different types of procedurally generated maps, so I used that as a basis to create each level. This creates varied maps with little effort, but you loose a bit of control of how the levels look. For this game some tweaking was needed to create appropriate maps, but having the basic map generation free from the engine helped a tremendous amount. The map selection functionality I also basically got for free from the engine. Time to work on the menus. The engine has all the wiring to create maps and menus and buttons and such, so it was not too much work putting it together. I spent most of the time on assets and menu item animations. I created an about-screen. I also had to spend some time on saving the player state between levels. I had to have some text on screen to show how much place you had in your bag for crops, how much crops total saved, how much crops left, how much crops the rats had eaten, and also the player experience points and level. I spent a lot of time to get the essential information on screen in an understandable way for the player. I don't think I succeeded entirely but it ended up way better than it was in the beginning when not even I understood why I lost a level. And then there was tweaking. Lots and lots of tweaking. The player gets more powerful with levelups (more fireballs, larger bag for crops, faster scythe swings that do more damage) but enemies also get faster and more numerous. When I was happy, it was time to implement the win/loose condition checks, saving of player state between levels, and all the necessary nuts and bolts. I added a medieval city name to each level to add to the flavor. I did add an achievement effect so that the player at least has a sense of achievement each time he increases in power. Each level looked very similar, with the same graphics, so I decided to add a different background to each level, and also to add some features like trees and bushes to give each level a more unique look, and more features. I wanted to include the 'end game win condition' and a 'win game' screen so it was actually possible to finish the game - but time did not permit. So now you can play and clear all levels but all you have to show for it is your score. You can replay the same level over and over and get more and more powerful. When you die you just retry. This is what bothers me most with the game, and what I would have worked on had I had one more day. Hopefully the game is still an enjoyable experience. TL/DR; I played and rated some games for WOA3 and I liked some of them. Like the graphics and the initial 'Missing sign' (that turns into a 'Found' sign when the missing... person... is found. The color theme matches the cold wintery surroundings. The only thing that sticks out a little is the text up in the right corner - text overlaps and don't quite fit inside the boxes. Also some noticable seams between ground texture tiles. The jagged sprites/simple animation fits well with the 16-bit art style. End of the level is a little tricky until you figure it out, and then you feel clever which is good. And is rewarded with a wonderful end of game animation that is a good contrast to the world you originally played in. Feels like you made a difference. The in-game music is good, simple and does not get in the way. Sounds are okay. End game music feels rewarding and cheesy in a good way. The game mechanics are tried and tested - run, shoot and jump on platforms. It is popular for a reason. It is immediately obvious what the goal of the game is. Move right. Jump. Shoot. Avoid the bad guys. The game is a little short (finished it in 10-15 minutes) but it was an enjoyable experience. The tutorial system is good in the way that it does not break up the gameplay. That the player jumps repeatedly when landing on spikes looks a little odd. Hard to know which chest to choose when there is no in-game description of what each of them does. (I chose the middle one). (Reading the notes I now understand it is a way to change difficulty - clever). Well... there is death. But useful? Maybe I am missing something. The intro screen is total eye candy. It reminded me of World of Warcraft, only much better. Animations are very good. The summoning effect looks great. Not too fond of the blood, it seems to go into an infinite loop and looks really strange. When the game starts there are some strange yellow squares appearing in the trees and some other larger red squares appearing in the distance. Glitches that break the illusion and kind of ruins the experience a little. The in-game music is AAA quality. I could play this game for hours and not tire of it. Good environmental sounds that transports me to a different place. The sound of getting hit grates after a while as it is the same sound playing over and over. The intro laugh is also a little annoying after a while. The 'out of mana' voice is cool. You walk around, and a bunch of soldiers chase you. Hit them with your sword, or preferably summon skeletons to do your fighting for you. In many ways it reminds me of World of Warcraft. I was disappointed I could not hit the pig. Don't exactly know what the goal of the game were, I never completed it, I don't even know if it is possible. Death is certainly useful in the sense that you summon skeletons. Game seems to freeze and you restart. Some tearing issues (might be my computer, although it is quite the beast). Some particle effect glitches - a 'blood disc' hovers in mid air and spatters something for example, don't think it was supposed to look like that. When dying, there is no indication. When hitting enemies there is no indication. No tutorial makes it a little hard to know what's going on, you have to hit the escape button (lucky) to show some instructions. Game suddenly returns to start screen and I don't know why sometimes. Did I die? Did I do something I shouldn't have done? Don't know. Chiptunes FTW. I love chiptunes. Others hate them. Shooting sound is a little intense. Hit sound is okay. Roll your ball around and aim with your mouse to shoot bullets at a horde of approaching balls in a lot of different intense colors. I did not understand a thing for the first 5 minutes but then I understood and it was actually quite fun. Hmmm, I guess you could say that 'Death is useful' since the killed balls become your new balls. But it is a wide interpretation of the theme. At first it seemed like I had no control over the ball, the game seemed to have frozen. It was unintuitive that you had to press the 'Play level' text down right to start the game. The menu is a little clunky to work with to say the least. Fun art style. The Lich looks adorably grumpy. Not much animation except the necessary pointing with the arms and skeletons that move up and down as they move but it fits the simple art style. As simple as it gets. No music. Walk around and point at enemies. Shoot them. Raise them to fight for you. Two different worlds, the real world and the ethereal one. Kill enemies in the real world, and get mana to upgrade your weapon in the ethereal one. In the ethereal one you can be killed by holy enemies. Gameplay is simple and effective, not too complicated. A good fit for the theme. Down right tutorial text was outside of the screen. Very simple graphics. My interpretation of the main protagonist is a ninja goat, or maybe a llama? Simple animation. Had to turn down the volume. Wearing headphones I got a little scare when starting the game. Push some things, I guess skulls, into a green square. Other things into a blue square. You can also jump. If you run too fast you fall over, but you can still jump, even on your head, no problem. The game is glitchy as hell, but it is kind of fun in its own way. There is a simple puzzle element. Goat seems to move extremely fast, you can easily run miles off screen with the camera not catching up. The main challenge is trying to push things without somersaulting over them. I don't see how death is useful in the game. But it has skulls. Reminds me of Goat Simulator since it has a goat(?) and many glitches. Simple but effective graphics. Cartoony and blocky but fun. The bunny is cute. :-) Menu transitions are smooth. Music sounds computer generated but is actually quite enjoyable after a while. The 'eat carrot' sound is great. So are the death sounds. Control the bunny and eat the carrots. Sometimes you have to sacrifice said bunny to let a bunny friend reach the next carrot. Impale it on spikes and jump on the corpse to cross spiked chasms or reach higher with your jumps. Set it on fire to run faster. Saw it in half so its carcass can weigh down a switch. Things like that. I'm willing to do it. And I laugh while doing it. First game to make me LOL. I did not want to stop playing this game. But alas, the show must go on. Definitely. Full score. Even if I don't give out score points. Already at the title screen I knew I was up for a treat. And I was not disappointed. Level design looks gorgeous, the main hero looks good, simple but effective move animation. Studio quality. Music that seems a little off at the moment the trumpets start playing but after a while I think the music fits the game well. Music piece is a little short, maybe it should loop. Sound effects do the job. You are Death and you like flowers. You water plants and cut away weeds with your scythe. The level is split i 4 equally sized parts in a 2x2 pattern that you can switch around at specific locations. The challenge is to jumble the level around so that you can reach all the plants. Very original mechanic and quite fun. I imagine it was quite hard to design levels at least if it was done completely manually. A fun game I'll get back to. Splash was a little blurry. 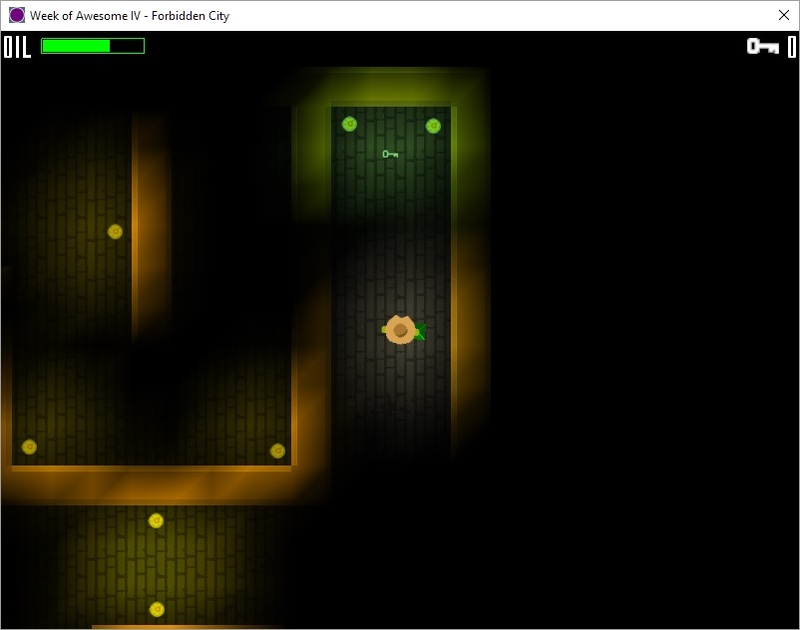 A top down view with very simple level graphics, however the animations were quite smooth. Environmental sounds were quite good. No music. It was okay I guess, not the strongest contender. Character did not rotate to look at my mouse pointer making it very hard to aim. Maybe it was my screen resolution that dit it? Screen shakes a lot if you walk into walls or collide with enemies, feels glitchy. I love how the tutorial is printed on gravestones. The main character looks good. with decent animation. The graphics is a mix of art styles. The main walking path is retro pixelated, bushes are completely flat, but trees, the background and other objects are kind of a smoothed embossed structure. Music is eerie and adds a lot to the mood of the game. Somewhat short, but that's okay. Maybe the game had benefited from some sound effects, but I'm not entirely sure, maybe it would just be distracting. You walk around and jump over gravestones and spikes. If you fall on spikes you leave a corpse you can then pick up and throw. You can jump on the corpse to reach higher. After a while you get more corpses that you have to juggle around to progress. Quite fun and some of the puzzles are real good. Simple but effective graphics. A slanted top down view shooter. 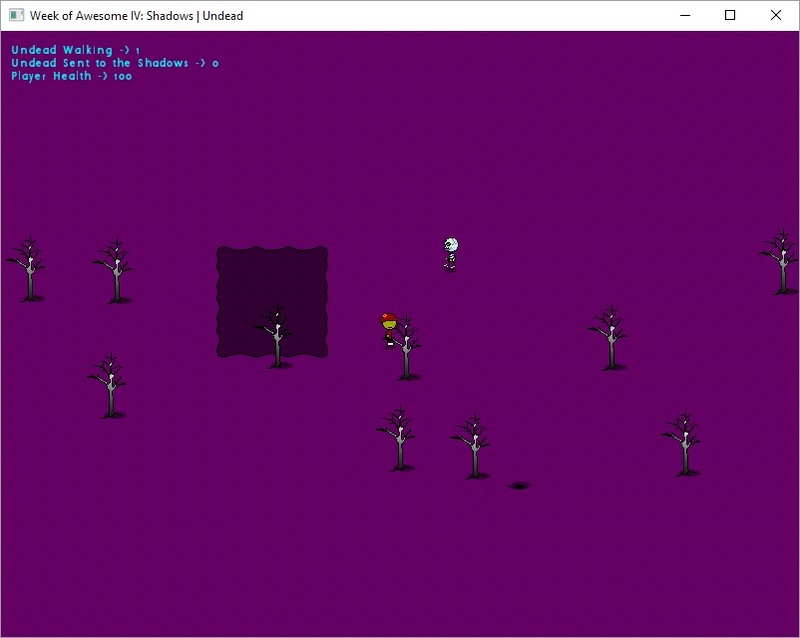 The rooms were a little featureless but the enemies looked okay, so did the spells and the protagonist. Great dark, rhytmic music. The first sound effect when starting the level was too intense. Did you record all your sounds using a microphone and your voice? It's fun but it clashes a little with the mood set by the music. Intro screen sets the mood with a poetic message about stealing powers. I'm getting excited already. The game is a top down shooter that reminds me of Run the Gauntlet. The gameplay instructions are included so that they appear as scribbling on the floor which is a nice feature. After 2 seconds I'm presented with the first interresting choice - spell power! I choose the firebird. I run around and kill some stuff then I die. After a while I realize that it is the enemies that steal MY power, and not the other way around as I expected. That's a cool mechanic. Well death IS useful - to the enemies! An original interpretation. The jumping enemies looks like glitches when they just disappear in thin air - I see the shadow and suspect it is intended, but I still think it would have been better to keep them on screen even while they jumped. Also I feel that the long cooldown effect for the powers lessens my enjoyment of the game. It is frustrating to have to wait that long for each missile to fire. Sometimes the same power appears twice in the select power screen. You can also select the same power for your main and secondary fire, don't know if that is intended. Simple graphics that do the job. It is a top down, blue maze. Enter dungeon and find loot. Then go to the exit. There are traps and enemies to avoid, and buttons to press to open doors. Some good puzzle elements, like triggering traps and pushing switches to open doors.To help you you can summon orcs and rogues. Some puzzles require you to time the sending of your orcs so they will push triggers at just the right time to progress the level. You have to split the loot with the mobs you summon, so don't overuse them for a better score. I spent a lot of time trying to solve the different puzzles, a good sign. Nice twist at the end. You sacrifice orcs to trigger traps, so yeah. It was a little hard to see the spikes and pitfalls. 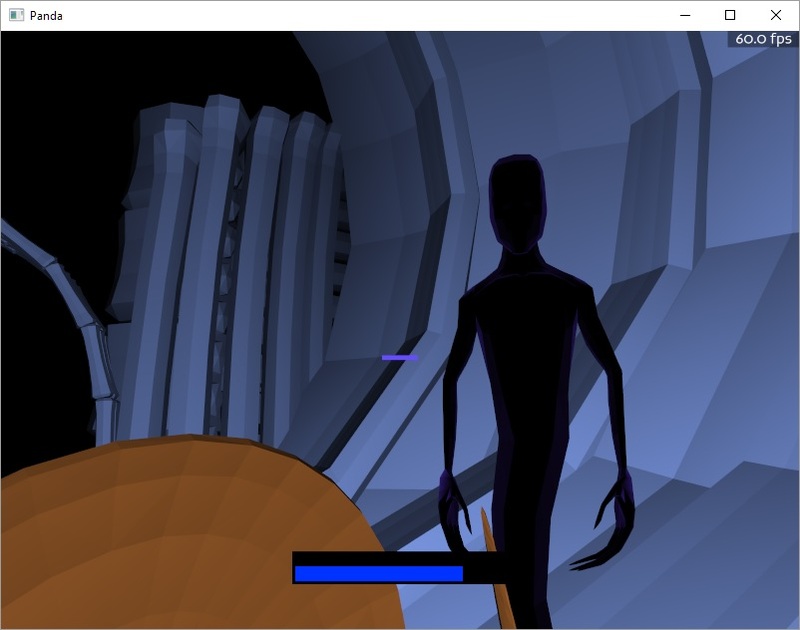 The player appears to walk even when standing still. The first time reviewing this game I did not even understand that I could summon anything. I suggest explaining that in a tutorial level or at least include it as an in-game text. The information was hidden in a quite long README file - that will never be read by most players - and the assigned keys were also an odd choice, numpad 4 and 5. Some glitches, one time my orc walked right through a closed door and so did the main character. You could easily get trapped in a locked room forcing you to restart the level using the escape key. The colors are intense. It's a 3D game. Models are balls and squares. Seen it before, but it's okay. The sound was a little painful to my ears. Was the sample rate very low? You are a rolling ball trying to push square blocks off of a platform. You can dash to push harder, and jump to avoid some enemies that will just roll you off the platform if you don't. The platform grows a little each time you push off another block. The challenge increases with the number of stronger and smarter enemies of different colors that shoot and whatnot. You get a performance rating at the end and also uncover a sentence with one letter each time which is a cool feature. Menu is very simple but does the job. It was a little hard to control the ball but I guess that is part of the challenge. Gamepad support is very nice. It is annoying to have to use the mouse to press play between each often very short game. A game with a rendered 3d intro! A little crude, but still cool. The game is a sidescroller. Few but strong colors and flat surfaces. Nice smooth parallax effect of rolling hills as you walk around. When you go over hilltops you look up at the underside of the next hill creating some clipping problems. Animations are good. A rendered Game Over screen also. Music is very good. Sound was OK.
At first you can't do anything. You're just floating there, and the game seems to have frozen. After you die once you can 'undie' to gain control of your character and walk. I think this is a poor design choice. If you die again you can jump apparently, I never got to experience this because I could never get past the first level and you can't jump in level 1 for some reason - only die. Which I did. Again and again. And again. The game without jumping is too hard. You have to time walking beneath a mushroom that jumps which is very hard with just one mushroom. With more mushrooms it becomes impossible. Sometimes mushrooms seem to appear out of thin air on top of your character and it's game over. Again. And again. I could not get past more than one hilltop before I died. And I tried maybe 50 times. I guess, since you have to 'undie' to control your character. The 'undie' animation looks good but lasts too long, which quickly gets annoying. Sometimes the game won't let you control the character at all even after undying. A mechanic that disables control of the player until you have died was a poor choice. The graphics is a rather odd mix, with a realistic starry universe background, a rendered 3D turret in the middle of the screen, cows in spaceships or spacesuits that look half-cartoonish, and explosions that look fully cartoonish. Funny music that helps setting the silly mood along with the title of the game, the title screen and the back story. Cows moo when you shoot them which is funny for a while. A horrible laughter sound when you fire the special weapon. You control a rotating turret in the middle of the screen. You shoot down approaching cows in spacesuits that enter from the screen edges and head straight for your turret. Your health is 'grass' and you gain power as you shoot down more cows. When the power bar is full you can fire a blast that kills all cows on screen. The title of the game and the silly setting had me interested - for a while. I kept shooting cows until I had killed about 200, wondering if something more would happen. It didn't. The splash screen was blurry, almost unreadable. I'm actually thinking the game is going to be disqualified because of it. The title screen was nice though. The in-game environment graphics are really good, but your main character is a pill and the enemies are black orc silhouettes with pink axes. This looks like a debug build of some sort. The music and environmental sounds were good and fit the setting. You click on some pink corpses to make them become pink followers with pink swords. You then move around quite slowly to find some orc silhouettes with pink axes. You get close to them and they die suddenly. You then continue and even if you move really slow you outrun your followers easily. Meet some new orcs. Get close to them, wait for your followers to catch up, and they die suddenly. I see some potential here but the game is not in a playable state as it is now. Well yes you summon corpses. I had to start and restart the games 3 or 4 times to get it to run. The menu buttons were simply unclickable. But finally I managed to start the tutorial level. The camera angle made me dizzy after a while, something with the camera angle combined with the fov and the constant rotation that hit a nerve. I had to stop playing because of it. Cool neon graphics. Like the effect when the ships passes over a grid line, it looks positively cool. The transition between the levels look cool too. I could play the music at a hip geek party without making a fool of myself. I really liked it and it adds to the hectic experience. The sound effects were a bit simple and could be more space-y. You control a neon spaceship by accelerating, braking and rotating right and left. Shoot down enemies and collect stars. When you die you switch to a different level (I guess a 'death' plane) with different enemies and more stars to collect. If you die again you switch back. There is a countdown of one minute, and after that time it is game over. I found no way to extend the time. The gameplay is simple but yet engaging enough to keep me playing for a while trying to beat my own score. You die to go to the 'death plane' to collect more coins in a shorter amount of time. So I guess yes. I think the game would benefit from some real newtonian physics. The controls just didn't feel natural even though they were precise enough. Maybe even make it possible to aim with the mouse? It took a couple of plays to understand what was going on. No readme file in the distribution either. I never tire of lovely retro graphics. The movement of the character looks really smooth. Nice particle effects. I especially like the 'dash' effect. The combination of retro style graphics and high quality effects is always nice. A 2d sidescrolling platformer. You control an elf with a sword or a gun, it is kind of hard to tell. You go right, jump, dash and shoot. Billboards provides an in-game tutorial explaining controls and mechanics. Aim in all four directions. You can dash to jump higher. Kill humans to collect their souls or let the demons kill the humans and collect their souls anyway. Souls fill up your power meter and also fills a power bar for firing more powerful blasts. Demons will kill you so jump, dodge and shoot to make your way around. Kill all demons to progress to next level. It is a little difficult to get used to the controls first but when you get the hang of it you can perform some pretty cool moves. The gameplay just feels 'right'. However I think there are too many demons too early on, it gets tiring killing that many demons every few meters. I'll probably come back to this game later to play some more. Reminds me of Cave Story... and I loved Cave Story. All those poor humans had to die just to make you more powerful. So death has a purpose I guess. The game would benefit greatly from controller support. No readme file. Intro looks very professional. Great intro, both music and graphics wise, it really sets the theme. Menu screen also looks good. The levels have a black background and is build by colorful blocks creating a nice contrast. The player leaves a red trail when moving around and 'bullets' leave a trajectory. The main character looks a littly corny, it could maybe have an animation when standing still in addition to the 4-frame(?) run animation? The stuff you are supposed to pick up (souls/crystals?) also look a little pixelated. Sound and music is very good, from the intro with a recorded voice reading the intro text, to the menu and in-game music, to the sound effects - everything is of impeccable quality. 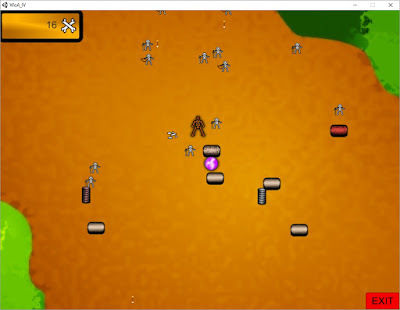 You control a little caveman dressed in a toga in standard 2d platformer style, move right, left, jump and shoot. However you don't shoot traditional bullets, you shoot something like an aim to where you want to teleport. You need to teleport to places you can't reachy by jumping, like over wide chasms with spikes or up to far above platforms. Pick up all blue crystalsn and a red crystal appears. Pick it up to finish the level. The game had 5 levels. You get different star ratings depending on how well you did timewise which is nice. The game would have been very enjoyable game had it not been for a crippling bug that freezed the game regularly (see notes). As it is, it is only enjoyable. I did not notice any perks with dying. There is a bug in the game. Collect the first red blood drop. Shoot it off screen. Jump into the spikes. You never reappear and the game freezes, and you have ro restart, Game did not save progress. The fourth time this happened on level 4 I gave up and quit the game. Well, it's a text adventure. A black box with text in it. Some of the text has colors. The graphics serves its purpose but nothing more. You are supposed to escape a house, old text adventure style. Type in your commands like 'unlock door' to do stuff. I escaped the house in half a minute after typing maybe 6 commands. I had to restart to try to die to see if it was useful. I managed to do so. And it wasn't. Great retro graphics. How did you manage to create such cute caracters with so few pixels? The animation is adorable, and each character has so much personality. I'm green with envy. The level is made up of white floor and red traps and green buttons. Simple high contrast color scheme. A fun animation of a ghost each time you die and also some particle effects (fog) that hides traps. Cool distorted robot voice telling you what's up in the intro. It eggs you on if you hesitate in front of a trap. It mocks you when you die the first time in a way that tells you how the game works in a clever way using just one sentence. Brilliant! No tutorial needed. The same voice also introduces the level and comments on your gameplay, and tells a joke now and then which is very cool. It does repeat itself after a while but I don't mind. The music is a nice chiptune that is a nice fit for the game, the sounds are bfxr/sfxr all the way. (I think). Loved the intro. Reminded me of portal. An evil corporation performs experiments on cubers to get permission to do whatever they want with them. Control a group of super cute characters in a set of 'tests' done by the corporation. Sometimes you have to kill yourself by finding and drinking poison or you accidentally die by jumping on spikes, and when you die the corpse is useful for the next character that can use it to jump... aaah I'm not repeating this, if you have read the reviews of some of the other games you know how the game works already. ;-) But it is done in a good way. Controls work well. A very enjoyable game in every way. I'm playing this more layter. The player character bobs up and down in a rhytmic fashion. It would have been great if they bobbed in tune with the beat. A green snake made up of a head and some balls for a body moves around on a grid with different symbols on it. The tiles contain apples, vegetables etc that looks... well okay I guess. There is a picture of some snakes oogling some rats in a cage and a snake with a doctor frock with a pill glass. The symbolism is strong with this one. There is also a simple scoreboard to the left. Cheesy music. Very simple sounds. The hunger bar increases and you have to eat stuff to not starve. You control the snake around with the arrow keys. It moves painfully slow and jerky. To create food you have to match three tiles on the board by clicking them. Sometimes it was game over and I don't know why. Depending on what you eat your zinc/copper ratio will change this and that way. Don't know if it means something. Sometimes pills appear and when you eat them a lot of rats pour out of the cage. I was like 'What did I just witness'? and 'What is this?' most of the time playing this game. I think the intention was probably great with a political message and poor animals and all but the game just didn't do it for me. Don't think so, I kind of think the game was entered into the wrong competition? The intro screen looks cool with a drawing of two of the monsters in the game. The game graphics itself is quite simple, a black background and a maze. Cartoony monsters with personality. At first the sound is awesome, whispering and whimpering, like the sounds you would expect coming out of a high security insane asylum. After a while I just had to turn the sound off, it became too intense to keep listening to for extended periods of time, I feared ending up in an insane asylum myself if I did not turn it off. There are also a couple of attack sounds that sound... a little odd. Some kind of screams that I guess is supposed to illustrate the ghost's attack but it does not sound 'ghostily' enough. There is a tutorial that explains the mechanics. Choose a ghost to control it. You can turn invisible and back again, and you have two kinds of attacks. When invisible the monsters can't see you. If they see you they approach you quickly and try to kill you. When you go invisible again they stop moving. You can use this to position them where you want them. If you kill a monster you get more ghosts you can use against the next monster. The walls did not seem to prevent monsters from attacking you, however they blocked monsters paths. You, I guess since you are a ghost after all, could walk right through walls. When you kill all monsters on a level you progress to the next, and all your ghosts carry over to the next level. The next level has more monsters and so it goes. I did not notice any difference between monsters or attack strengths. Maybe that could have added some more variety to the game. Killed monsters become your new allies, so yeah. Initially I was unable to make this game stay on screen for more than 2 seconds. The sound (whispering voices) plays but the game persistently minimizes itself over, and over, and over, and over... I tried the game again the day after after a reboot and the problem went away. The game froze regularly if I moved the mouse focus from the game to another application or to the desktop. Looking at the start menu I was half expecting a space game because of the color theme and choice of graphical style. Splash and title screen text almost unreadable. Otherwise decent graphics, especially the water effects are cool. Character model is also okay. The sounds immediately told you this was some kind of survival horror game. You learn to recognize the sound that plays when you're about to die after a while. I THINK you are probably going to do something useful in the death world so I'll say yes based on good faith. Some glitches. I dug a hole in a hillside and when I got out of the ditch I was suddenly under the hill in a pool of water and had to reset. The final package has now been posted in the competition thread! I have tried to follow the principles in http://archive.wizards.com/Magic/magazine/article.aspx?x=mtg/daily/mm/174 - the judges have to, ehm, be the judge of if I have succeeded. Working alone has been more a blessing than a curse. It is a blessing because I have to work with a lot of stuff I don't usually do, for example sound and graphics. I am becoming quite the expert in Gimp and Audacity, and have found a few good online sources for good material. I have also been forced to cut a lot of the stuff I originally had planned for the game, and in the end I think that is a good thing. I have also discovered some tools to auto generate sound, music, soundscapes that I am going to utilize during Ludum Dare coming this weekend! (In a way the 48 hr Ludum Dare is less of a challenge than this week was - I am much more exhausted now, even though I almost had no sleep during LD32). This has been an amazing week. I must have worked 100+ hours on this game since monday. I'm exhausted but in a good way. I have been developing a custom game engine for the last few years (what game developer haven't) - and the proof of the pudding lies in the eating, so to say. A lot of the code I wrote for this game goes rigth back into the game engine (homepage: KodingNights.com) - although the merging will be a pain - especially during the last 2 days there has been a lot of kinda-working, but alas not very well written code produced! I'm definitely going to merge the tutorial system, the intro story system (consolidated to become the same thing), the behaviors and the infection stuff, and a lot of other neat and nifty stuff I needed to create this game. It's especially fun to watch the mobs infect each other with the plague, and to slash rats in such a way that the bounce in all directions. It has been very interresting to follow the progress of the other teams during the week - and a special thanks to everyone who have downloaded and tested my game and has provided feedback. Now it's up to the judges - although I feel we are all winners! Some of the games I have seen easily rival titles that sell for good cash money on app stores and even Steam. "Infection spread, infection kills, death lingers and rats eat the dead"
Death is Awesome - BETA is now ready for you to try. What can I say... it has been hard work, but it is unbelievable what you can achieve in a short amount of time when you put your mind to it. This sixth day has been polish, polish, tweak, tweak, bugfix, bugfix... A little bit of coding here, some new graphics there - I have even recorded my own voice for several of the sound effects! Quite fun, actually. I have also created level up mechanics with improved weapons and speed, increasing difficulty as you progress through the levels, a quest system to create the first tutorial level, and also implemented the plague itself that spreads from mob to mob. I have not had time to read any other journal entries today, It's been intense. But I look forward to go through them now and see what you guys have been up to since last time - then i need a few good hours of sleep, and I will tweak and publish my final package some day tomorrow. Just a quick entry to praise sound recorder and voice changer apps on Android.